The La-174 is a gift rank V Soviet jet fighter with a battle rating of 8.0 (AB/RB/SB). It was introduced in Update 1.39. 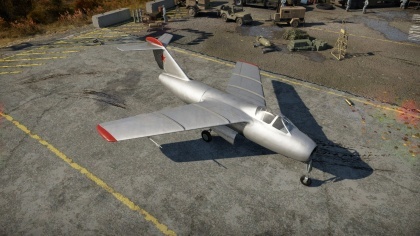 The La-174 is a prototype variant of the La-15, possessing slight differences in statistics and a variant color scheme, and has been occasionally available for research in the Russian tech tree following the La-15. To research the La-174, the La-15 must too be researched, even during the rare periods the La-174 is available for research. The plane must be researched and purchased during this time, and is otherwise unavailable. The La-174 shares many of the same attributes as the La-15, and thus shares the same general strengths and weaknesses as its brother. The La-174 is an incredibly fast aircraft for its tier, but suffers from various issues. The La-174 is unable to carry any secondary armaments, such bombs or rockets. It is equipped with three very powerful 23 mm cannons. These carry 100 rounds of ammunition per gun. Which works out a total of 300 rounds of ammunition. Due to its incredible top speed for its battle rating, competing with the fastest at 8.0, the La-174 should apply boom and zoom tactics. Gain altitude (and thus energy), and use this energy to execute hit-and-runs on opposing aircraft. Your powerful 23 mm NR-23 cannons will help you kill targets in minimal time. Though it is not the worst jet at turning, it suffers from the issue of having incredibly weak wings, and they will likely snap if you attempt to turn fight other jets at high speed. However, if it needs to turn, it can hold its energy for an extended period of time and come out of a turn at a higher speed than most opponents. Examine the survivability of the aircraft. Note how vulnerable the structure is and how secure the pilot is, whether the fuel tanks are armoured. Describe the armour, if there is any, also mention the vulnerability of other critical aircraft systems. Due to its incredible top speed for its battle rating, competing with the fastest at 8.0, the La-174 should be employed in boom and zoom tactics. Gain altitude (and thus energy), and use this energy to execute hit-and-runs on opposing aircraft. Your powerful 23 mm NR-23 cannons will help you kill targets in minimal time. Despite the fact it is very manoeuverable, it suffers from the issue of having incredibly weak wings, and they will likely snap if you attempt to turn fight other jets at high speed. However, if it needs to turn, it can hold its energy for an extended period and come out of a turn at a higher speed than most opponents. The F-86 Sabre is the one of the main rivals of the La-174 if up-tiered and facing allied teams. The Sabre can easily out maneuver, out run, and out climb the La-174. The best way to counter the Sabre is to attack it when it is at its most vulnerable position (low on energy, or damaged) or force it into a low speed maneuvering fight. Do not try to engage a F-86/CL-13A Sabre in any high speed maneuvers or any high speed dog-fighting in general as the Sabre will come out on top. In any low speed manoeuvers, the Sabre will lose to the La-174 in any manoeuvering engagements. The Meteor is another main rival of the La-174 as the La-174 can meet the Meteor at any time from being down-tiered to up-tiered. While the La-174 can out run and out-climb early variants of the Meteors, the later variants are far harder to out run and out climb as they can easily catch the La-174. The best way to deal with Meteors is to apply boom and zoom tactics, but do remember a skilled Meteor pilot will have no issue avoiding a La-174 that is attacking with boom and zoom tactics. Avoid any maneuvering fights with any variant of the Meteor as they will out maneuver you with no issues at all. It is recommended to unlock in this order: Fuselage Repair, Offensive 23 mm and Compressor. As a prototype of the La-15, the La-174 saw no combat experience. Only one was ever built, and it crashed during flight testing. Compared to the production version of the La-15, it was powered by a British Rolls-Royce engine, rather than the Russian-made Klimov RD-500k which was derived from the aforementioned British turbojet engine. 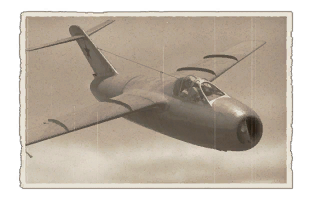 The La-174 is only available in limited time periods in events, unlocked right after the La-15 in the main USSR tech tree. The La-174 was available between 11 September to 18 September 2017 to honor Lavochkin's 117th birthday. This page was last edited on 8 March 2019, at 07:55.